Two things we read about looking for a boat. First, get what you want. Fixers turn out to be more expensive than spending more and getting everything initially. And second, when you board the boat it will feel right. Well if everything goes right with the survey on Friday, we have found Sereno. She is a 1989 30 foot Catalina in really good shape. We are making more of a committment than we originally planned but it feels right. We originally looked at older boats in the 18K range, but basically they were well older and didn’t have the electronics this boat has. 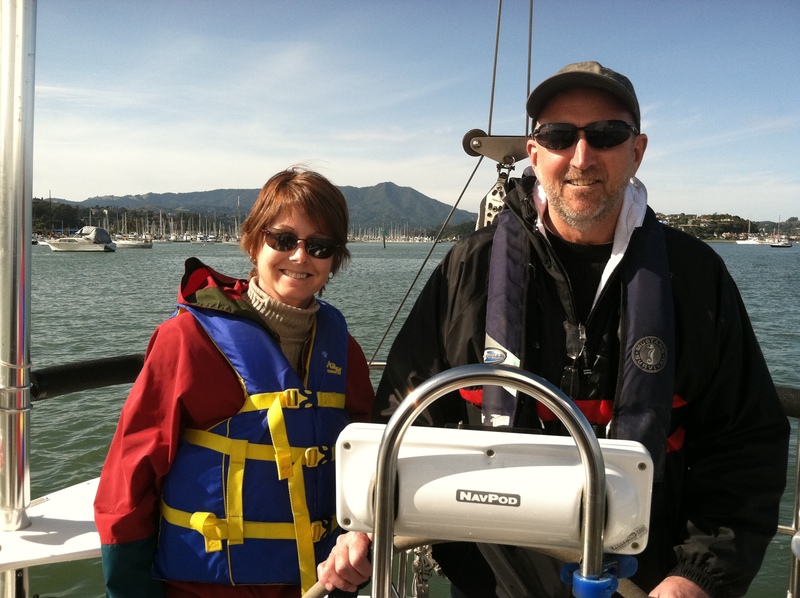 The owner took us out Sunday on the San Francisco Bay and what a blast (no seasickness for me!). Still figuring it all out. We need to find someone to crew with Gary for the trip from Sausalito to Benicia (about 4 hours) and we want to get the bottom painted while it is out for the survey. Austin seems excited as he may go with Gary on Friday for the survey. Not sure how it will all come together but we are enjoying the ride. I’m glad I will have more things to post about now as we start our adventure with Sereno. If luck was on our side I would be writing that we are now the proud owners of a Watkins Sea Wolf 30 footer. But alias when we went to see her the owner already had a deposit. She was very well maintained by the current owner and had a very nice interior. We left with a committment to call us if the current deal falls through. We also saw a Hunter however the v birth fit a child (though our Sheltie would have loved it), the customization in the saloon meant that the table didn’t convert to a bed and the overall height didn’t work for Gary let alone our 6 foot 2 son. So the hunt goes on. There doesn’t seem to be the inventory here in northern California that there is in other parts of the country. But I know that our patience will pay off. Yesterday we saw a 30 foot Island Bahama and 36 foot Catalina. We figured out that we should probably stay around 30 feet for this first boat. It would be cheaper and easier to learn on. Both boats were very clean and appeared well maintained. Since then we have been surfing the internet looking for comparable boats to the 30 foot one and we have come to the conclusion that at 18.5K it is overpriced for the current market. We have 3 comparable boats to look at this coming weekend in the bay area. If anything, viewing those boats will give us the knowledge to better negotiate the price of the 30 foot one. We did confirm that the marina we want has slips available. So it was a productive weekend!